The baby’s room is my most favorite room in the house. I am still amazed that it turned out so nearly exactly as I’d envisioned it. Stuff like that doesn’t usually happen with me. I designed it with one person in mind. No, not the baby. ME. I was going to be the one in there the most, awake, at all hours, so I wanted it to be comfortable and soothing and a place I could be happy and it is. It really is. It just so happens that B likes it too, so, bonus for that. 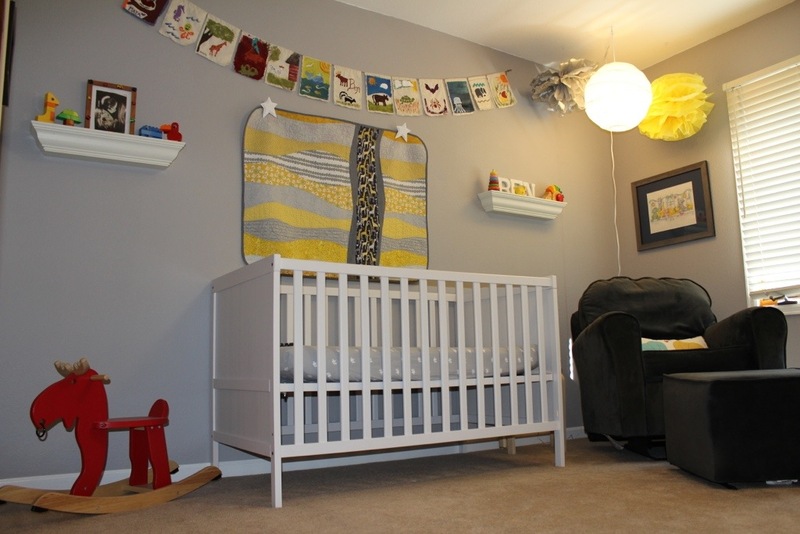 The foundation pieces of the room are a white IKEA crib and large dresser and the gray paint on the walls. At first, I’d wanted gray and yellow, but as the room took shape, I included more colors and am really happy that I did. Its a little eclectic, which I like. Anyway, then I added a wonderful gray rocker/glider chair and footstool that I adore and fall asleep in all the time when I’m nursing in the middle of the night. For a pop of color (that’s designer lingo–I watch HGTV so I know) I added an IKEA rocking moose and a DIY rehabbed brochure rack turned bookshelf that I painted a bright red. Originally, I was going to do circles of fabric on the walls for decoration, but we were gifted so many beautiful cross stitches that there was no room for the fabric circles and in the end I love all of the handmade art even more. There are still a few things I’d like to do (swap out the gross brown closet doors for white ones, get a new shade for the window, put up a shade or something) but since its 95% done, I figured it was time for a tour. 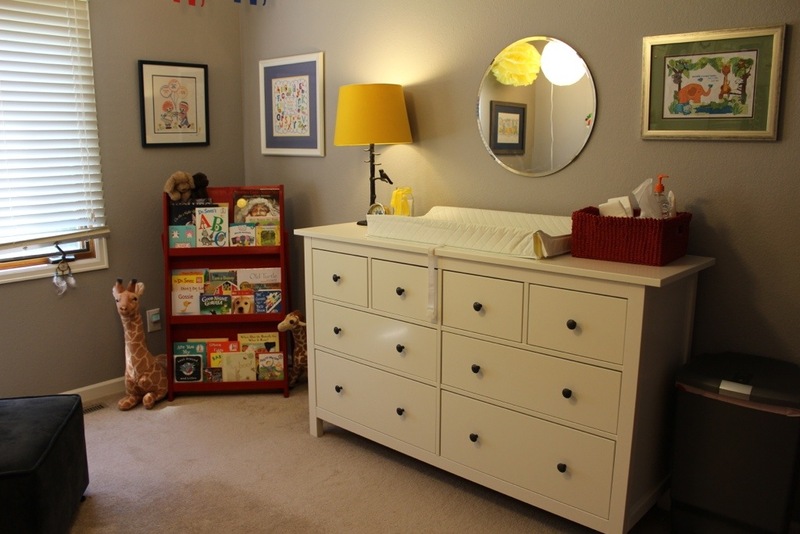 IKEA HEMNES dresser in white and KOLJA mirror; little bird lamp, yellow shade, and red basket from World Market; red bookshelf by me! The cross stitch over the dresser was made for Ben by his Grandma T. The ones over the bookshelf are mine (right) and T’s (left), both made by my mom. There are so many wonderful things in this picture I don’t even know where to start! The banner was made my all the wonderful woman who attended my baby shower–each made one of the flags. The amazing quit was designed and sewn by my dear, dear friend MA from college–she’s crazy talented! 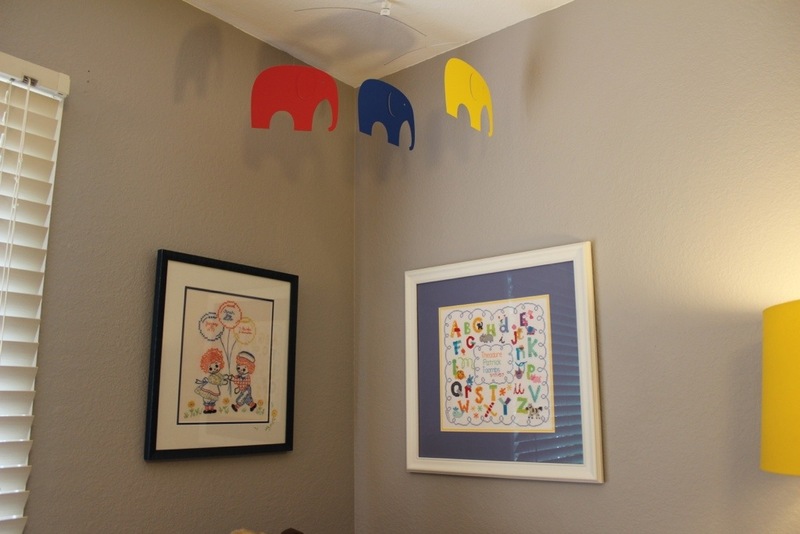 My sweet niece did the poofs that hang in the corner. She thinks the gray one is misshapen and will be mad that I am showing it to you, but I love it just the way it is! The cross stitch that hangs above the chair was done by my cousin AW and seriously looks like a painting–the detail is so fantastic! 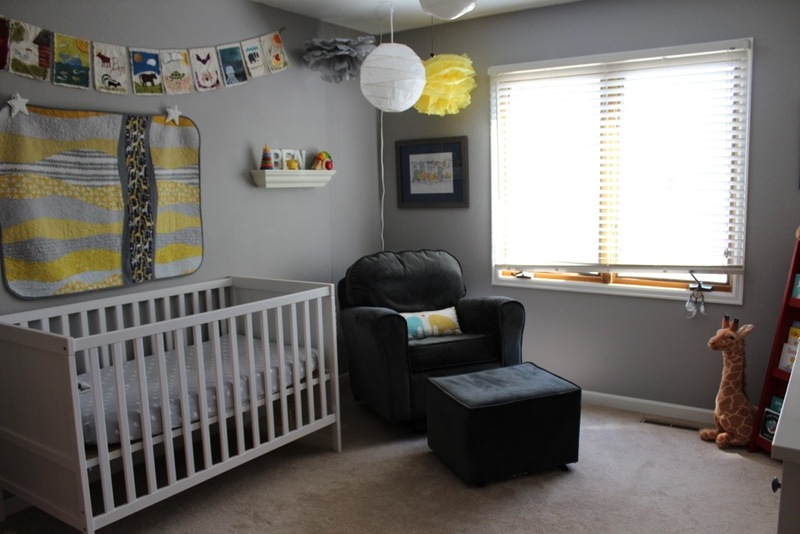 Also in this picture: IKEA SUNDVIK crib (converts into a toddler bed) and IKEA REGOLIT hanging paper lamp; Newco rocker/glider from BabiesRUs. The two little shelves are another favorite aspect of this room. 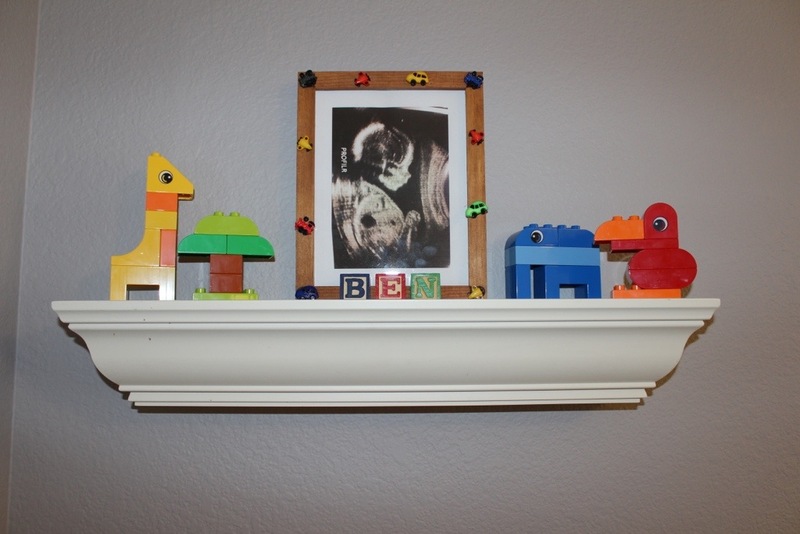 One has some bright and fun lego animals that my niece constructed along with a photo of baby Toopis “on the inside” in a frame made by my big seester-in-law. 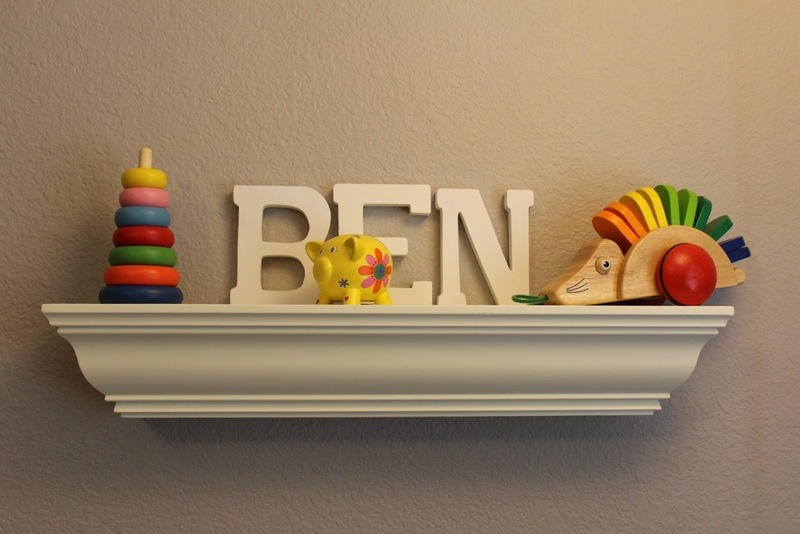 The other has baby’s name and some bright wooden toys. 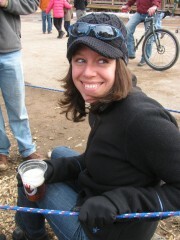 And then there is EKORRE the punk rocking moose (notice the nose ring? Such a rocker! Get it? ROCKER!). B and I both love the elephant mobile. I found it in a cute little children’s store in Portsmouth, NH while I was there on a work trip. They make great shadows on the wall and he loves to watch them dance around. 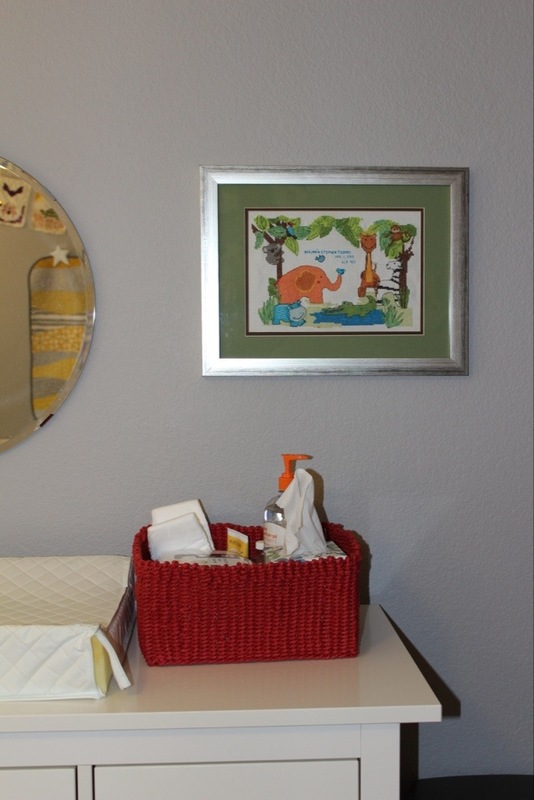 The little red basket has been perfect for holding all the changing table supplies. The cross stitch by Grandma T is just adorable with all the jungle animals. This looks so cute!!! I love it all, Especially the colors.